The first preference-based fit solution for online retail. When shopping online, the inability to try clothes on means shoppers lack confidence when selecting their size/fit. Tailored provides the ultimate confidence by comparing the fit of garments they already own to the fit of garments you sell online. Increase the likelihood your customers will make the correct choice the first time. Garment sizing has become arbitrary and consumers are more confused than ever before. Tailored recommends garments to shoppers based on a dimensional match to items they own and also suggests their best size. A confident customer is the best kind of customer. Now that you know their fit preference, you can recommend new styles now or in the future. 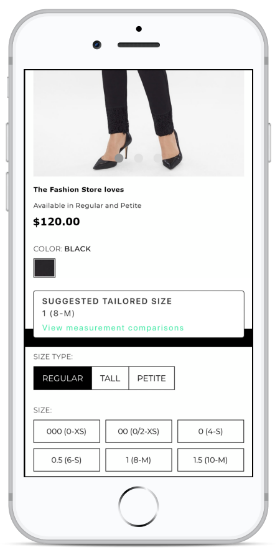 Tailored provides assistance to shoppers who need help selecting a size before buying. New and current customers can instantly sort your catalog by styles matching their fit. Simple integration, no complicated site changes.